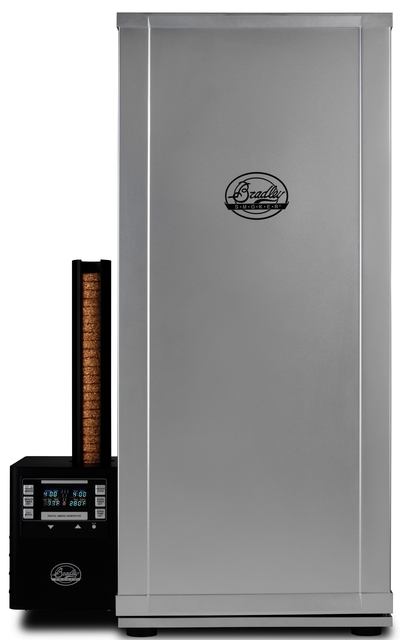 The Bradley 6-rack Digital Smoker includes all the features of the original Bradley Smoker along with the benefits of digital technology. Temperature, time, and smoke are now completely controllable so you can decide how much smoke you want, how long your food will smoke for, and at what temperature. Digital Smokers offer an easier and better way to automatically roast, smoke and barbecue outdoors. Comes complete with 6 adjustable racks, user guide, recipe book, rectangular tray and drip bowl, and a 12 month manufacturer warranty. The Bradley 6-rack Digital Smoker includes all the features of the original Bradley Smoker along with the benefits of digital technology. Temperature, time, and smoke are now completely controllable so you can decide how much smoke you want, how long your food will smoke for, and at what temperature. Digital Smokers offer an easier and better way to automatically roast, smoke and barbecue outdoors. Comes complete with 6 adjustable racks, user guide, recipe book, rectangular tray and drip bowl, and a 12 month manufacturer warranty.